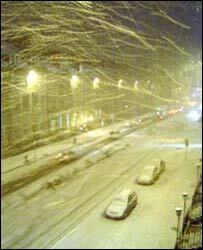 Snow has hit much of the UK but forecasters say the cold snap will get worse later in the week. The heaviest snow overnight fell in the east - particularly East Anglia and northern England - and those areas are expecting more heavy downfalls. Kent will have heavy snow on Tuesday night and by Thursday East Anglia and the south east face serious travel disruption due to snow and ice. Snow is due in east Scotland but Northern Ireland could escape. Wednesday is expected to bring heavier and more-widespread snow showers, with the North Yorkshire moors likely to be the snowiest area. Blizzards in Scotland, particularly on high ground, forced the closure of more than 30 schools in Aberdeenshire on Monday. The Pennines and Cheviots are expected to be the worst affected areas this week, with up to 10cm of snow predicted and treacherous conditions expected on Wednesday and Thursday. A Met Office spokesman said temperatures will be below zero in the worst affected areas, making driving dangerous due to icy roads. "Forecasters are keenly watching developments through this week, with a real possibility of some significant snow in the south," he added. Southern England has seen some of the worst travel problems, with train passengers enduring delays and cancellations to London-bound services. 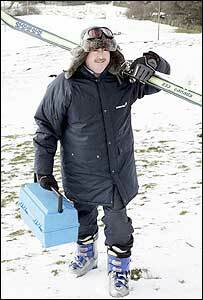 Meanwhile, in Lancashire, freezing homeowners in snowbound villages were assisted by British Gas engineer and former army skiing instructor Allan Rushton. He answered emergency call outs to remote villages across Saddleworth Moor. Eastern Scotland is expecting some snow showers, while Northern Ireland is forecast only occasional flurries of sleet and snow over the next few days. But severe weather warnings remain in place across most of the UK. The Highways Agency has told drivers to be extra vigilant and to delay journeys if bad weather persists. Many of the country's roads have been clogged up by weather-related accidents. And traffic problems on the M6 in Staffordshire were made worse when a lorry carrying liquid carbon dioxide crashed and exploded on Monday night. One driver was killed, around 100 motorists were evacuated from their cars and four people were taken to hospital. Police have not said if the accident was weather-related. The snow showers claimed the life of 20 year-old Mark Young, of Ashington, Northumberland, who died after suffering neck and back injureis in a sledging accident on Sunday night. The late winter cold snap is due to high pressures over Scandinavia and northern Europe and low pressures to the west of the UK, causing temperatures to plunge. It has come as a shock to those who assumed the worst of the winter was over - particularly as last month was the warmest January for 15 years.